I recently had the opportunity to work on a really cool project: a 1968 Chevrolet Camaro owned by Vance Worley, pitcher for the Minnesota Twins. Having just been restored, the Camaro’s cabin was already in excellent condition. However, Worley wanted to modernize its look without straying too far from its original styling. He decided that the best way to do this would be to install contemporary front-row seats – upholstered in houndstooth and black Madrid grain vinyl to match its rear seats, which would remain original. Worley settled on 35th Anniversary 2002 Camaro seats because of the sporty look and feel of their high-back buckets. 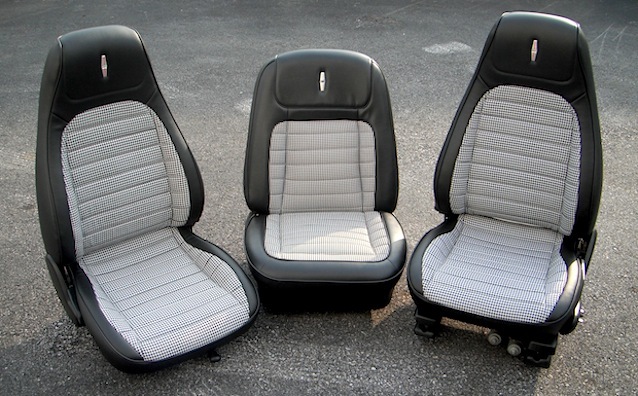 The goal was to replicate the pattern of the ’68 Camaro’s deluxe upholstery on the donor seats. Because the structures of the seats were so different, compromises had to be made on the pattern, but details like horizontal pleats continuing up the bolsters would have to remain. I began by marking my center points and sketching a few different pattern lines with white pencil for he and I to decide on. After some back and forth, we settled on having the base’s insert panel continue to the very front of the seat instead of stopping 2” shy of the front. We also decided that a curved line on the bolster of the base – where the houndstooth meets the black vinyl – would look sportier than a straight line. 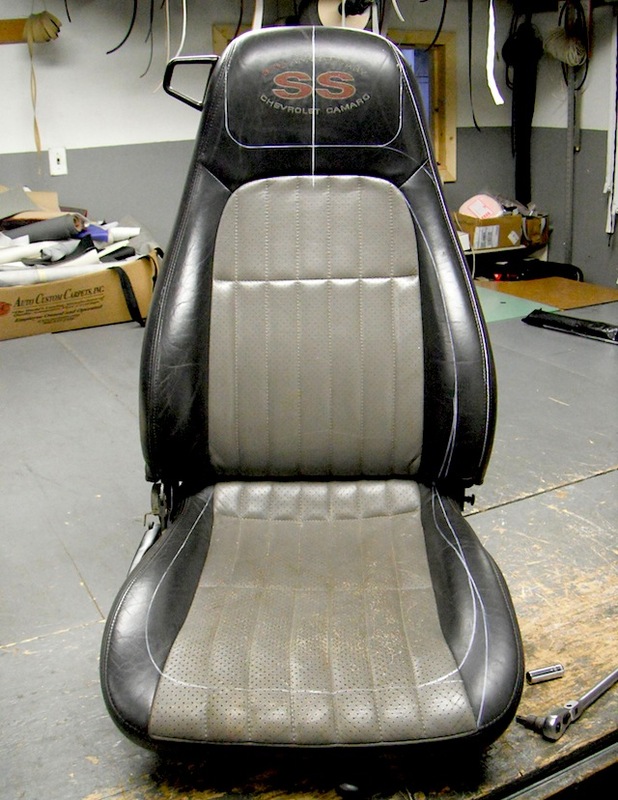 What’s more, we chose to incorporate a U-shaped line into the headrest area of the backrest to replicate a similar pattern featured on the ’68 Camaro’s original upholstery. Notice: I created all my patterns off of the passenger’s seat – as it is almost always better preserved than the driver’s seat. The same goes for the inside bolsters, which is why my lines were drawn on the inside half of the seat and mirrored for the other half. 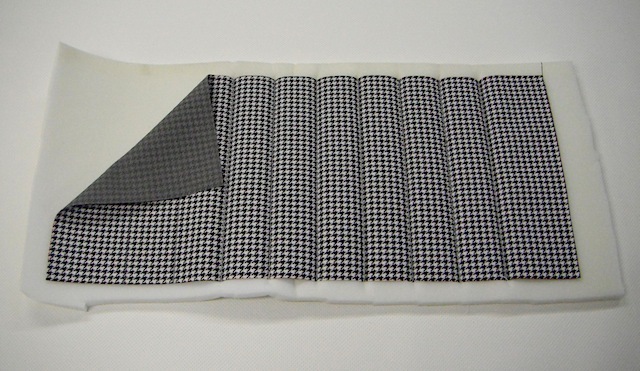 Normally, sewing pleats is a breeze, but doing it on black and white houndstooth had me thinking I’d gone cross-eyed. Much like an optical illusion, the cloth’s pattern played tricks on my eyes. In fact, I had to keep rubbing them just to see straight. To complicate matters, I was also extremely limited by what color pencil I could use to draw my lines. Neither white nor black would work, because they blended too well into the pattern. Brighter colors, like yellow, were also out of the question – as I’d never be able to erase them afterwards. After much trial and error, I settled on a silver Sharpie marker, which was just dark enough to be seen and sewn over, yet faint enough to get lost in the pattern without having to erase. 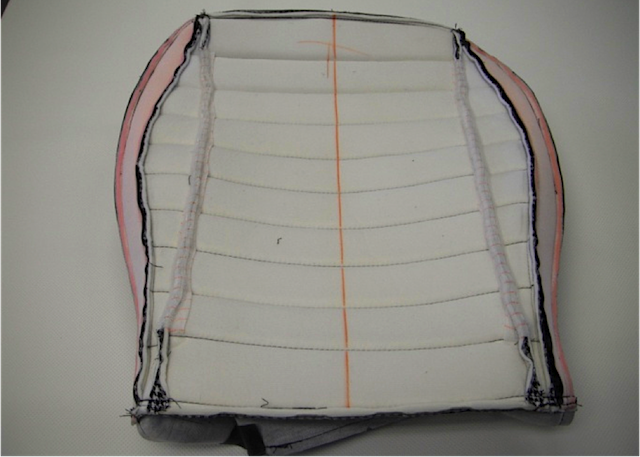 The pleats were sewn to ½” sew foam at 2.25” apart – allowing for shrinkage to the final size of 2.125” each. Notice: I didn’t glue my material to the sew foam. I’ve always seen this as an unnecessary step that creates more disadvantages than advantages. 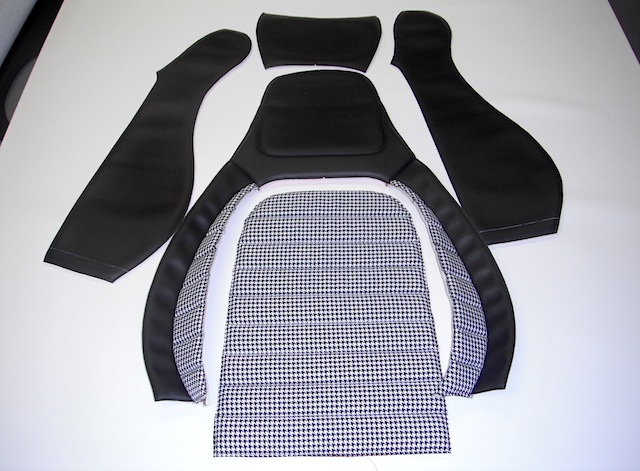 Using glue will almost certainly cause wrinkles after a seat cover is installed. Because this particular style of seat doesn’t allow upholstery to be attached via hog ring, I had to sew the houndstooth material to ½” Velcro sew foam with Velcro listing sewn over the seams. The rest of the bolsters were sewn to regular ½” sew foam. The skirt of the base was sewn to 1/8” sew foam and the sides and back of the backrest were sewn to ¼” sew foam. Keeping true to the original style, I forwent French seams for handmade piping. I’ve always preferred handmade piping to the premade plastic stuff because it has a softer feel and matches the grain and color of the vinyl much better. Finishing touches, like repainting all of the plastic moldings and reproduction ’68 Camaro chrome medallions installed on the backrests, really set off these seats. The customer was thrilled and I can’t wait to see his car when it’s complete. Thank you Janice and Selvage! Cool project and i also like the explainatioj of how you set it up. Ive never heard of velcro sew foam, so the whole thing is velcro? 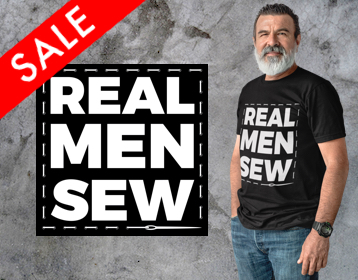 And then you used velcro on rhe seams as well? Thanks Tina. The velcro sew foam has a backing that sticks to velcro. Very few cars uses this type of application but it’s good to have a few yards stocked in your shop for when you do need it. Are you working out of Minnesota? I’ve always called a mix of the old and new newstalgia” Probably spelled wrong. No my shop is just outside of Philadelphia. Worley played for the Phillies last year and his car was still in the area. Could you please contact me about a job. Thanks. 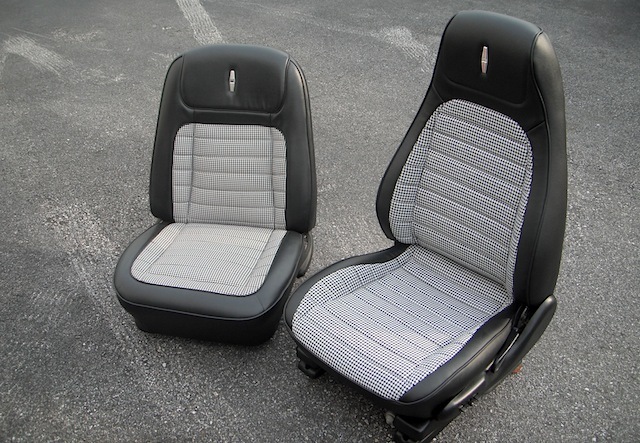 Would you consider making a set of these exact seat covers for bucket seats. I recently had a lower bach injury and i find it very uncomfortable to drive my 68 camaro with it’s low bucket seats. I have been looking for an alternative option and these look great. Thanks John, sorry to hear about your back. Email me at info@thehogring.com and we can discuss making you a set of these seats. the most perfect blend of old new school combo more so than the current TMI product. i would interested in purchasing a set of covers as well if interested in reproducing. Thanks Alex. I’d be happy to make you a set. Email me at info@thehogring.com so we can talk about it. Nice seats! I like the original combination of the houndstooth cloth and black vinyl material. I only wonder why the small seat in the center of the two bucket seats? The medallion was precise to add the last touch! Thank you Cesar. The small seat in the middle is the original seat for the car. I modeled the two other seats after it. I photographed them together to show the similarities between the original seat and the new one.